Tell us a little about yourself. Your educational background, past work experience, personal accomplishments, etc. Stephanie: I have worked at Delta Dental for five and a half years in government relations – primarily handling legislative analysis. Before coming to Delta, I worked for California Primary Care Association (CPCA) for five years, representing clinics that mostly serve the uninsured and underserved. At CPCA, I was the Assistant Director of Federal Affairs, so I ensured everyone was educated on the Affordable Care Act and what that would mean for them. I really enjoyed doing that. I started in advocacy and legislation working for Congresswoman Doris Matsui. I worked in her district office, doing a lot of healthcare outreach and that got my feet wet to move toward straight advocacy. Devin: I also came from Doris Matsui’s office, which is how I met Stephanie. Before that, I worked in D.C. for Congresswoman Lois Capps on the Energy and Commerce Committee. I focused on health policy, assisting with health reform bills and analyzing them before coming to Sacramento. I have a Master of Public Health (MPH) from George Washington, and being in D.C. was a great experience to see first-hand how legislation is made and how it goes through the regulatory process. So I know how to analyze things here when they come across the table. Before we’re all work and no play, what do you like to do for fun? What are your hobbies or interests outside of work? Stephanie: I’m an avid skier; my husband snowboards and the kids ski. Living in Sacramento, we’re close to Sierra Nevadas, so we get to play in the snow, but we don’t have to live in the snow. It’s nice! Devin: I’m into biking. I live in a super small apartment downtown, but we have four bikes. I also love to hang out with my dog. Okay, so getting down to business, what is your role at Delta Dental? Stephanie: We keep track of new legislation and regulations that affect our enterprise companies. Because our brand is in 15 states plus D.C., that’s where we spend most of our focus. We have lobbyists in each of these states. We write letters of support or opposition and take part in advocacy activities. We’re also part of the National Association of Dental Plans (NADP) and America’s Health Insurance Plans (AHIP), which help us advocate on the issues happening in states where we don’t have as much presence. In 2017, we tracked 750 bills. More than 5,000 bills come up in our search topics, and we narrow those down to those that might affect us. 150 of the 750 were signed into law; 50 of those affected us. What is it like having a direct impact on health policy and legislation? Stephanie: It’s feeling like you can make a difference. You can work with constituents when working for a congresswoman. You see the impact. In this role at Delta Dental, it’s writing a support or opposition letter and seeing your advice taken into account. Devin: Stephanie and I both really enjoy politics and the legislative process. It’s a hobby to be involved. Being active in the political process and analyzing legislation and regulations might seem intimidating to some people, but we enjoy digging through them. With our background, sometimes we are lucky in that we intuitively understand the way a bill may have been designed a certain way and why. We just think it’s fun! It sounds like you get to have fun for a living. What jumps out as making your work worthwhile? Stephanie: Coming to this job being raised in California, it’s so interesting learning how other states think. I enjoy going to the Capitol in other states and learning that different perspective. The fact that we have people with boots on the ground in all these states is so helpful. I even went to Montana this year, and partnered with Jim Dole (Sales Account Executive). He was so great at explaining how things tick there. I love learning the history. And I was in Atlanta advocating on a bill recently – that perspective keeps things interesting. Since you’re new to Delta Dental, what are some of your first impressions? What do you like most about your job so far? Devin: I most enjoy the team I work with; they understand my background. We’re all equally passionate about the work we’re doing and we all want to be as helpful as possible to other business units. My first few months here have really been about becoming a better resource to the rest of the company. So far I like the openness to collaborate and work together. Part of our purpose as a dental benefits provider is to “enhance lives” — can you cite an example of something you’ve worked on where you truly think we’re achieving that purpose? Stephanie: There was a piece of legislation enacted in California in 2015 — AB 648. We supported this bill, which was brought forth by consumer groups. It establishes virtual dental homes, which is kind of like telehealth. Dental providers and hygienists can work in low-income areas, schools, Head Start programs, and clinics and are able to do initial screening and send that info to a dentist somewhere else who can view the x-rays to evaluate. It helps people where they are. We were the only dental plan in California to support this bill and it was signed into law. This year, we also supported another California bill, SB 379. There was already a law that says all kids in California must see a dentist before first grade. This bill lets dentists host free oral health assessments at schools because many kids who aren’t do the screenings either don’t have insurance or they’re on Medicaid and don’t have time. This bill will make it easier for kids to have this assessment before first grade. We’d agree that your role is definitely helping in our purpose to enhance lives. Let’s end on a fun note. Since you two work with such complex subject matter, how would you describe your job to an eight-year-old child? Stephanie: Gosh, okay. I would say that I’m working to make sure more people have the chance to see a dentist and be sure their teeth are clean and free from sugar bugs. I get to meet with a lot of people and talk about really important issues … I get to go around the country trying to make it easier for people to see the dentist. What do you think of that? Perfect. Okay, and now a different question. If you had to create your own campaign slogan, what would it be? Devin: I’ll go with my nickname from childhood and it was Devin from Heaven. I like to think that I’m very nice, and I’ve been successful in working in legislative offices because sometimes you have to deal with people who are… not so nice. So my campaign would definitely be centered around that. I’d come in on a cloud, and there would be lots of stars and some fun music! 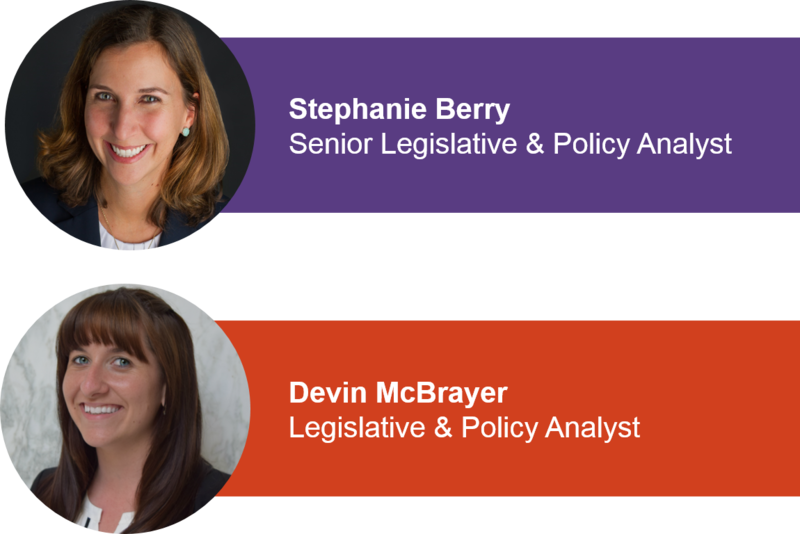 Thanks for taking the time to get to know two members of our Public Affairs team! For more content and industry news, subscribe to our newsletter.